WE Furniture AZF36ALCT is a modern round shaped wood coffee table with a solid metal frame, painted metal base and a sturdy laminate top. It is rated 4.1 out of 5 stars, product losing points mainly due to the assembly issues, like a screw hole not being drilled properly. You can purchase it in gold/dark walnut (AZF36ALCTDWG), glass/gold (AZF36ALCTGGD), faux marble/gold (AZF36ALCTMGD) or glass/chrome (AZF36ALCTGCR) with small price differences. You can choose the color that will best suit your other furniture in your living room. Please note that these are not shiny looking but have matte finish. Out of four model options, two have the round tempered glass that is about an inch thick. You’ll receive it unassembled but the detailed instructions and all the tools you need are included in the box. It is reported to be very simple to assemble in under ten minutes by some customers, just put a few screws on and you’re done, assuming that all the screw holes are shipped drilled properly. Please note that the legs are not adjustable for height and you can’t put wheels underneath as it doesn’t come with such mechanism. WE Furniture Coffee Table weighs 19 pounds and measures 36 x 36 x 19 inches. It appears to be a good size coffee table for a big percentage of living rooms. And it is not very tall and even if you’re a short person you’ll be able to put your feet up on this coffee table while sitting on the couch. The legs are painted aluminum, not MDF like the top section but it is the light variety as the whole thing weighs 19 pounds. It has the tempered glass that is almost an inch thick and with the base and MDF it looks elegant and classy overall. 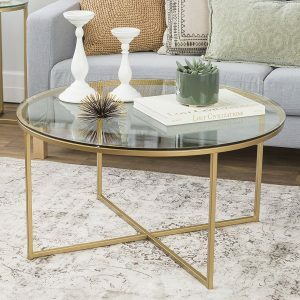 For the low price point you’re getting a very decent coffee table with a beautiful class design, that is easy to put together and that is sturdy and durable overall, including the thick glass part. 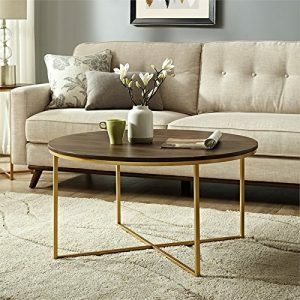 When we read through the negative reviews for this coffee table, most of them are to do with shipping or assembly issues. It does actually look more expensive with a premium look and feel, than the price tag indicates. One of the customers commented that they could easily compare it to the coffee tables that cost hundreds of dollars more at the furniture stores. The design will certainly enhance the room it is placed in. The shipping is usually on time, in a few days via Amazon.com and the unit you will get seems to be just like shown in the photos.